Henson originally conceived Jareth as a puppet, but then rethought the character as a charismatic human actor “with musical talent.” Bowie soon came to mind (the other top candidates were Michael Jackson and Sting). 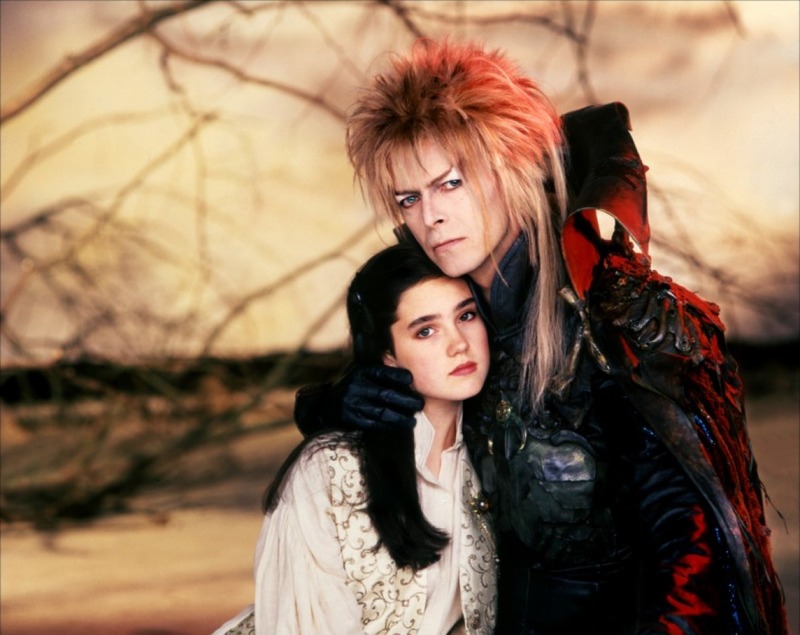 Meeting Bowie in New York during the Serious Moonlight tour, Henson offered him the role, showing Bowie some of Brian Froud’s sketches for the proposed film, and giving him a tape of The Dark Crystal, Henson’s first foray into more “adult” fantasy. Once Bowie received the Terry Jones-penned script for Labyrinth, which he enjoyed for its “inane insanity,” Bowie was game. So from April to September 1985 Bowie spent long weeks in Elstree Studios making a film in which his co-stars were an infant, a cast of puppets (the first days of Bowie’s shooting were mostly a loss, as Bowie kept looking offstage whenever a puppeteer spoke his lines) and a 14-year-old actress with whom he had the best on-screen chemistry of his career (Jennifer Connelly, to Marc Spitz: “I was just this side of getting it. Getting who David Bowie was. He was really sweet. I liked him very much.” And Bowie compared her at the time to the young Elizabeth Taylor). When Iggy Pop turned up in London to play Bowie some of his new songs, he was bemused to find Bowie spending his days in a Tina Turner fright wig and ridiculously tight trousers (more on the infamous pants in a later entry). And some at Bowie’s label, EMI, were starting to publicly worry about what Bowie was doing. 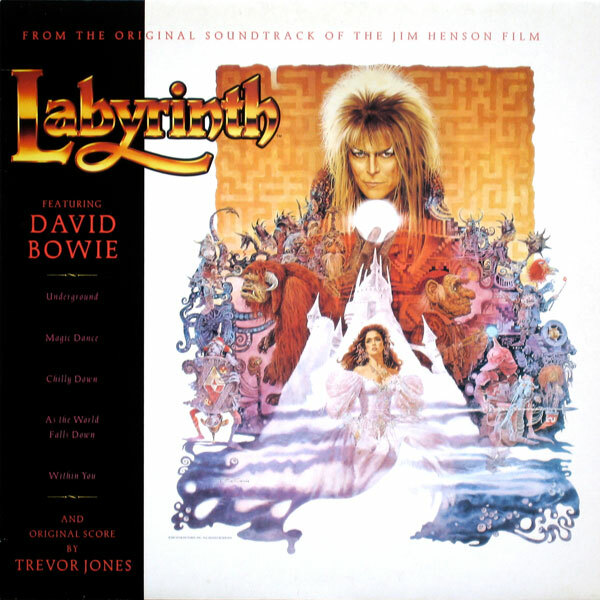 Think of Bowie’s five Labyrinth songs as a secret mid-Eighties Bowie album. It finds Bowie in his typical scrapper mode, using pieces he had considered for a “proper” album and repurposing them for the soundtrack of a fantasy movie. Bowie reworked old themes, looking for flashes of life, still trying to write himself out of his funk. So a rousing singalong goofy kid’s song (“Magic Dance”) is also a pop trope as old as “Love Potion No. 9”; the ballad “As the World Falls Down” is one of his loveliest, saddest pieces of the era; the brief “Within You” calls back to the Berlin records and even Baal; and the main theme song is a compromised attempt at a Young Americans sequel, complete with the return of Luther Vandross. Then there’s “Chilly Down.” The context, for those who haven’t seen the film: Connelly, looking for her kidnapped brother, falls into a pit, which is populated by five jabbering puppets, the Fireys. They dance around her, their heads float off and plop down, they rip out their eyeballs, play croquet with their limbs, they maybe attempt to kill her—it’s not quite clear, as it’s a poorly-directed and shot scene, with Connelly lamely wandering around, then decapitating puppets, one by one. (My mother, upon watching this scene in a recent family screening: “well, that’s it for me,” and left the room.) It’s also the worst-looking sequence in the film: where much of Labyrinth has gorgeous sets and matte paintings, this is mostly green-screen antics; it’s as though Henson took The Claws of Axos as his main visual inspiration here. 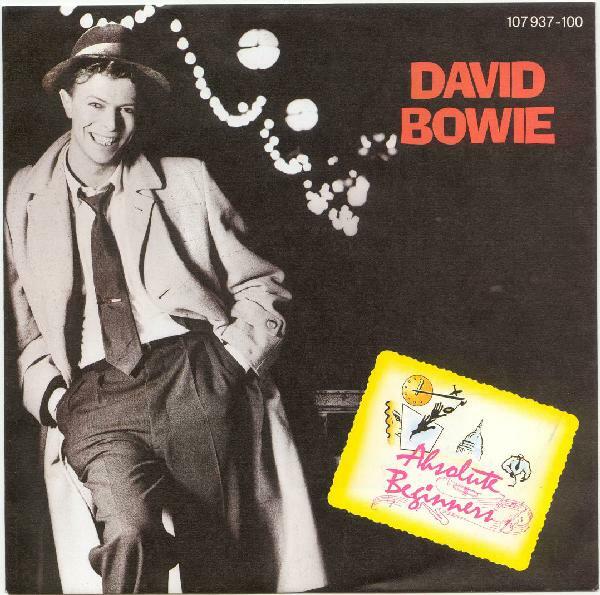 “Chilly Down” was the first piece Bowie wrote for the film, and its rhythm tracks were cut during the Absolute Beginners/”Dancing in the Street” sessions in late June 1985. (It’s the same lineup: Neil Conti on drums, Matthew Seligman on bass, Kevin Armstrong on guitar.) Bowie cut a guide vocal for the puppet voice artists—Charles Augins, Danny John-Jules, Kevin Clash (Elmo’s voice) and Richard Bodkin*—and Bowie’s voice is still faintly audible at times in the mix. Creepy voices aside, “Chilly” is a mildly interesting song: you can hear Bowie in places toying with the chorus melody of “Absolute Beginners” (there’s the same descending piano line) while the lyric, about a gang of grubby layabouts with no money who are dedicated to keeping it chill, is something Bowie could’ve written for Iggy Pop to sing (“strut your nasty stuff, wiggle in the middle yeh” or even better, “good times, bad food“). And only Bowie would throw in an out-of-key chord change (a move to E-flat in what’s been a straight A major song) in the middle of a rap written for a puppet. * According to the soundtrack LP credits and Nicholas Pegg’s guidebook. The Wikipedia entry lists different singers, including Karen Prell and Rob Mills, without attribution. I recall reading somewhere (a commenter on Popular, most likely) a DJ taken by the response he got whenever he played “Absolute Beginners,” especially towards the end of an evening. It’s the Bowie song that people forget they love, he said. If “Ashes to Ashes” kills off world-altering Bowie, “Absolute Beginners” finishes world-popular Bowie. Very nearly a UK #1 (held off by Diana Ross’ “Chain Reaction” and a Cliff Richard/Young Ones duet), “Beginners” is the end of Bowie’s days in mainstream pop, with only one more solo appearance in the UK Top 10 to come in this survey. While some of its chart success was due to Absolute Beginners hype (which explains in part why “Beginners” died such a death in the US, only reaching #53, as the film flopped there), “Beginners” was loved too, as it was one of Bowie’s most open, most heartfelt-seeming songs, even if he occasionally sounded like Neil Diamond on the chorus (especially on “hard lines”). Having recently looked up pop hits of my childhood in the late Seventies-early Eighties (as memory-triggers for this new project), I was struck by how many of them had been “adult” pop songs, for lack of a better word—songs about commitment, missed chances, regrets, sacrifices, sneaking around, feeling used up but still keeping at it. Some were saccharine and self-deceiving, some were home truths. “Still the One,” “Reminiscing,” “Against All Odds,” “Secret Lovers,” ““Oh Sherrie,” “Hard to Say I’m Sorry,” “Glory Days,” “Solid,” “Still the Same,” “Don’t Answer Me,” and so on. At some point, by the turn of the century, country music had annexed most of these songs, leaving today’s pop charts far more ruthlessly dedicated to the pleasures and preoccupations of youth (with many exceptions of course, Beyoncé being the first that comes to mind). This outcome would’ve been fine for me as a kid, because I always hated when some ballad about being lost in middle-aged love knocked off an important song like “Rock Me Amadeus” in the charts. But as dreary as I thought them, the songs were a collective undercurrent, giving warnings that life in the years ahead would have different pleasures, different worries, than those I was consumed with then. It was perhaps the last time the pop charts were a generational dialogue, even if both sides weren’t particularly interested in listening to each other. This is a long way of saying that “Absolute Beginners” falls into this decaying line of adult pop—it’s not a song for young people, though Bowie casts himself as a beginner in love. His nearly-improvised lyric, marked by slant rhymes (“ocean/reason” or “offer/beginner”), is subtly an extended pledge of love as one long equivocation. Even at his most heartfelt, Bowie’s still hedging something. A heartbroken man is trying out love once more. He’s been down so long that it feels like it’s the first time again, and he’s so intoxicated by the promise that he feels as though he can start over from scratch. But he can’t, and he knows it—his eyes are open, his feet are on the ground, he’s unfortunately sane. The first verse closes with “I absolutely love you/but we’re absolute beginners“: it’s a declaration undermined with a quick caveat. If I don’t know anything about love anymore, then I don’t know if this will work. There’s wariness in the chorus as well, despite the unbounded joy of the vocal melody and the soaring sentiments about flying over mountains and laughing at oceans (though recall that Bowie’s not talking about love here but its commercial vehicles—songs and films). Where the first chorus finds Bowie reassuring his love, saying that there’s no reason to dwell on the past, to be pessimistic, by the chorus repeat he’s come back down. If there are reasons to be afraid, if you are worried you’re making another mistake, then you may well be right. And you realize Bowie’s been playing with the word “absolute” the whole time. “Absolute” as an adjective means an unconditional fact, as in a pledge of “absolute” love, but the word also means to be completely independent, to be utterly whole. Two absolute beginners may be awful lovers, for they’re complete in themselves and need nothing else added. “Beginners” was a throwback to the type of studio improvisation that had created the likes of “Heroes,” which suggests again that Bowie in his declining years needed to will himself into a state of determined, frenzied creativity before he could produce top-flight work. This arguably had been the case with Station to Station or Low too, but now it was ten years on from those records. Bowie was rich, unchallenged and at a loss of where to go. Then, in a pick-up session for an inconsequential film soundtrack, he managed a late lucky strike. Quickly dispatching the “Motivation” demo (with which “Beginners” shares an opening guitar line), Bowie and the band had time left on the clock, so they began working on another piece Bowie was considering for the film. Fueled by a mix of cigarettes, Cuba Gold coffee and cocaine,** Bowie sketched out a few chords and lyric phrases, then led the band through the song as he was writing it. Building the song eight bars at a time, scribbling out the lyric in bursts, Bowie took cues from his players’ suggestions—a key change; an exuberant bassline courtesy of a beside-himself Seligman. 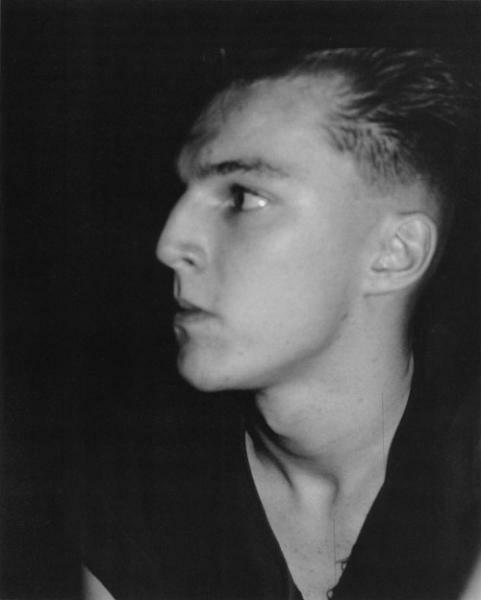 Playing the role of Eno to his new charges, Bowie offered suggestions like “think green” or “sound Brazilian.” According to Sandford’s bio, Bowie also kept the mood light with a few pantomimes, like filming an empty glass on the recording console or hanging a painting on the studio wall. However, despite this, “Beginners” doesn’t seem to drag. If anything, there’s a sense of having enough room to spare—take the way Bowie will take his time on every phrase, often languidly singing a three-beat line over four bars. The song’s fluid, able to be extended and shortened at will without sacrificing its feel, as long as you cut to the meaty chorus ever so often. So there’s a five-minute single edit, the eight-minute “master” version on the soundtrack LP (and used for the video), the two-minute cut for Absolute Beginners‘ opening credits, the six-minute cut for the end titles. “Beginners” was easily extended by Don Weller’s saxophone solo and a Luis Jardem percussion breakdown; it was just as easily compressed to a single verse/chorus. When Clive Langer and Alan Winstanley, who were producing the Absolute Beginners soundtrack, heard Bowie’s studio demo of “Beginners,” they were flummoxed, as they had no idea how to improve it. “We’ve been handed this one on a plate,” Langer recalled saying in the elevator afterwards (as per Buckley’s bio). The main addition was fulfilling Bowie’s request for a backing singer “who sounds like a shopgirl.” Langer and Winstanley found the 22-year-old Janet Armstrong, whose vocal on “Absolute Beginners” was her first-ever professional studio session. (It’s yet another play on the title, as Bowie is duetting with a literal absolute beginner). Bowie’s lead vocal was cut during a freewheeling session in which he imitated Lou Reed, Iggy Pop and Bruce Springsteen—the tapes, sadly, haven’t been bootlegged. “Beginners” (the instrumental “dub” mix, issued as the B-side, is a nice way to hear the intricacies of the backing track) is a collection of small pleasures—the way Nieve’s keyboards can sound like an accordion; Wakeman’s wry musings that become, during the chorus, a lovely embellishment on the vocal melody; the baritone-sax heavy horn section, which eventually takes up the “bom-bom-bahOOOH” vocal hook; the Jardim percussion break, capped off with what sounds like an analog attempt to match the Fairlight tom samples on Jan Hammer’s “Miami Vice” theme; Bowie and Armstrong’s last “true,” which they hold aloft as long as they can, then slowly bring it down to earth. The song felt valedictory, like a last gift, and it was. “Beginners” marks the end of Bowie as a mass property (it’s arguably the most recent song that the average person knows of his), his final hour in the center. Now he begins a long journey that will lead him back to where he had started: on the margins. Recorded June 1985 at Abbey Road Studios, London (with overdubs later in the year). Released March 1986 as Virgin VS 838 (#2 UK, #53 US). Performed during the Glass Spider tour, live for the BBC in 2000 (during this performance, Bowie raises his eyes to the sky while he sings “I absolutely love you,” and then mouths “thank you”—it seems like a prayer, but perhaps he was only acknowledging a vocal fan in the nosebleed seats) and as a duet with Gail Ann Dorsey on the Heathen tour of 2002. * Wakeman added what he described as the “classical piano/ Rachmaninoff type stuff” in a much later mixing session, where he and Bowie (who had been neighbors in Switzerland) spent a few hours reminiscing. **An apparent late-in-the-day indulgence, as it’s one of the last reported times Bowie used it. Top: Michael Schmidt, from the Waffenruhe (“ceasefire”) series, Berlin, 1985-86.